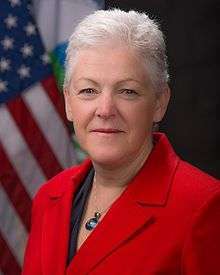 Regina "Gina" McCarthy (born 1954) is an American public administrator and an environmental health and air quality expert, currently administrator for the United States Environmental Protection Agency. On March 4, 2013, President Barack Obama nominated McCarthy to replace Lisa Jackson as head of the EPA. Confirmation hearings started April 11, 2013. On July 18, 2013, she was confirmed after a record 136-day confirmation fight, becoming the face of Obama's global warming/climate change initiative. A native of Boston, in 1976 McCarthy graduated from the University of Massachusetts Boston as a Bachelor of Arts in Social Anthropology. She later attended Tufts University, and from there she gained the further degree of Master of Science in Environmental Health Engineering and Planning and Policy in 1981. A longtime civil servant, McCarthy held the position of assistant administrator of the U.S. EPA from 2009 to 2013. Prior to 2009, she was commissioner of the Connecticut Department of Environmental Protection, 2004–2009. She has held several top positions in the civil service of the Commonwealth of Massachusetts, including deputy secretary of the Massachusetts Office of Commonwealth Development in 2003–2004 and undersecretary for policy for Massachusetts Executive Office of Environmental Affairs in 1999–2003. McCarthy has worked on environmental issues at the state and local levels and has developed policies on economic growth, energy, transportation and the environment. In her twenty-five years in public administration, she has been an environmental advisor to five Massachusetts governors, including former Governor Mitt Romney. From 2004 to 2009 she was commissioner of the Connecticut Department of Environmental Protection. In this capacity she implemented a regional policy to trade carbon credits to reduce greenhouse gas emissions from power plants. 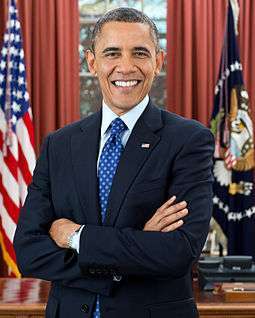 According to some observers, Obama's selection of McCarthy confirms that he is serious about battling climate change. Daniel Fiorino, director of the Center for Environmental Policy at American University, says: "Her nomination signals that the president really wants to deliver on his State of the Union objectives to take serious action on climate change." Others regard McCarthy as an environmental extremist  speculation that her appointment will affect Obama's decision on the Keystone XL Pipeline, Fiorino believes that this doesn't affect the dynamics of the Keystone decision significantly as other considerations are paramount, but adds: "... she knows air and climate issues very well and she's a very strong environmentalist." The EPA is one of the federal agencies that will advise the Obama administration on the proposed pipeline, "a project that would carry millions of barrels of bitumen a week from Alberta's carbon-intensive oilsands to the U.S. Gulf Coast". While the Senate Committee on Environment and Public Works approved the nomination in a vote along party lines on May 16, the nomination was stalled on the Senate floor. In the interim, Bob Perciasepe served as the EPA's acting administrator. David Vitter, the ranking Republican on the Committee, posed 600 of a total 1,100 questions, to McCarthy. The Committee Republicans demanded responses from McCarthy on five "transparency requests." The delayed nomination became the longest period on record that the agency was without a leader. Christine Todd Whitman, a former Republican governor of New Jersey and EPA administrator under President George W. Bush, stated: “It’s not about [McCarthy], it’s about the agency... Republicans lost the [presidential] election and they have to realize that this is the president’s choice of nominee. They can go after the president, but Gina McCarthy should get an up-and-down vote.” On July 18, 2013, the Senate confirmed McCarthy as the 13th Administrator of the Environmental Protection Agency by a vote of 59-40. On September 11, 2015, 26 Representatives introduced a resolution impeaching McCarthy. It was referred to the House Judiciary Committee and died. McCarthy is married to Kenneth McCarey, a wholesale floral salesman. They have three children, Daniel, Maggie and Julie. McCarthy also has a sister, Elaine McCarthy, who is a middle school history teacher. ↑ Smith, Sandy (July 18, 2013). "Gina McCarthy Confirmed as EPA Administrator". EHS Today. Cleveland. Retrieved July 19, 2013. ↑ The Huffington Post (March 4, 2013). Gina McCarthy Gets EPA Head Nomination From Obama. Retrieved 2013-03-05. ↑ John M. Broder (April 11, 2013). "Environmental Questions Take Back Seat at Hearing for E.P.A. Nominee". The New York Times. Retrieved June 17, 2013. 1 2 Mason, Jeff and Rampton, Roberta (February 20, 2013). Obama settles on EPA, Energy Department nominees: source. Reuters. Retrieved 2013-02-22. ↑ McCumber, David (February 21, 2013). EPA's Gina McCarthy under scrutiny. San Francisco Chronicle. Retrieved 2013-02-22. 1 2 Tracy, Tennille (July 18, 2013). Senate Confirms McCarthy as Head of EPA. Wall Street Journal. Retrieved: 2013-07-19. 1 2 U.S. Environmental Protection Agency. Gina McCarthy, Assistant Administrator for the Office of Air and Radiation. Retrieved 2013-02-22. Archived May 18, 2013, at the Wayback Machine. 1 2 3 The Washington Post (March 4, 2013). Biographical information for Gina McCarthy, Obama's pick for EPA chief. Retrieved 2013-03-05. ↑ CBC News (February 21, 2013). What will Obama's 'green quarterback' mean for Keystone XL? Canadian Broadcasting Corporation. Retrieved 2013-02-23. ↑ Bernstein, Lenny (May 16, 2013). "Senate committee approves Obama's nomination of Gina McCarthy to head EPA". The Washington Post. Retrieved June 17, 2013. 1 2 Eilperin, Juliet (May 29, 2013). "Is blocking Gina McCarthy at EPA a pyrrhic victory for Republicans? It just might be". The Washington Post. Retrieved June 17, 2013. ↑ Fifield, Anna (July 9, 2013). EPA nominee Gina McCarthy a victim of Washington’s toxic politics. Financial Times. Retrieved: 2013-07-10. Wikimedia Commons has media related to Gina McCarthy. "EPA chief Gina McCarthy on maintaining a 'diverse energy mix' for America". PBS NewsHour. 2013-10-24. Retrieved 2014-06-02.